Since moving to Austin to ease the pain of past, tragic mistakes, she has led a life of virtual solitude, coming alive only when she hosts her show. To her loyal listeners, she is a wise and trusted friend who not only takes their music requests but listens to their problems and occasionally dispenses advice. Paris's world of isolation is brutally threatened, however, when one listener -- a man who identifies himself only as "Valentino" -- tells her that her on-air advice to the girl he loves has caused her to leave him and that now he intends to exact his revenge. First he plans to kill the girl, whom he has abducted -- which he says he will do in 72 hours -- then he will come after Paris. Joined by the Austin police department, Paris plunges into a race against time in an effort to find Valentino before he can carry out his threat to kill -- and to kill again. To her dismay, she finds that one of the people she must work with is crime psychologist Dean Malloy, a man with whom she shares a history that had a catastrophic effect on both their lives. His presence arouses old passions, forcing Paris to confront painful memories that she had come to Austin to forget. As the clock ticks down, and Valentino's threats come closer and closer to becoming a reality, Paris suddenly finds herself forced to deal with a killer who may not be a stranger at all. 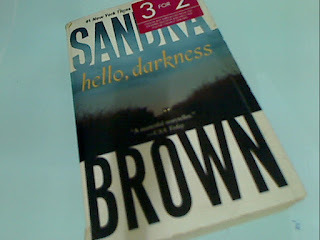 It has been a long, long while since I read anything from Sandra Brown. I remember she writes thriller. I remember there would be element of romance in the thriller but beyond that I have quite forgotten about her. Hello Darkness are among the lot I bought from someone from the capital city quite a while back. She wanted to contribute to charity and thus selling her book. I helped by buying them so, it was a win-win situation for both. I brought this title with me during my recent work trip and alternating between the other book that I brought, it was a very pleasant trip as I was practically in the middle of nowhere! Hello Darkness is quite a page turner. Readers were kept guessing as to who 'Valentino' might be and he could be a few of the characters identified earlier to the the readers. Playing the guessing game is part of the thrilling effect in this book. It's a nice title to get acquaiented with this author again.